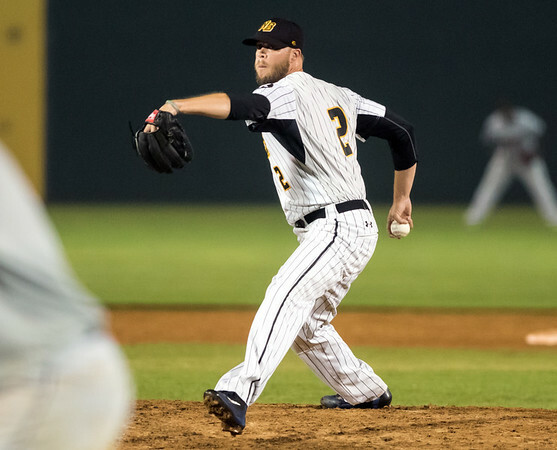 NEW BRITAIN - Evan Scribner could not have asked for a better homecoming than this season with the New Britain Bees. After graduating from Central Connecticut State University in 2007, Scribner spent parts of seven seasons from 2011-2017 in the major leagues with the San Diego Padres, Oakland Athletics and Seattle Mariners. But when the Tampa Bay Rays released him during spring training this season it gave the right-hander a chance to go back to where his career began. Scribner hasn’t disappointed the hometown crowd. In 33 games, the closer has given up just 25 hits and a 2.12 ERA. He has saved 21 games for New Britain, the fourth-most in the Atlantic League and made the All-Star Game back in July. But his most impressive skill may be his command of the strike zone. In 34 innings this season, Scribner has surrendered just two walks. The feat comes as no surprise - in 2015 with Oakland, Scribner had just four walks in 60 innings. Scribner believes his job has been made easier by the success of his teammates in the bullpen. Though the former big leaguer hopes to get back on a major league mound, he isn’t setting any goals for himself. Instead, his focus is on helping the Bees win games as they get ready for a playoff push. Posted in New Britain Herald, New Britain Bees, CCSU on Wednesday, 22 August 2018 21:03. Updated: Wednesday, 22 August 2018 21:07.